Two posters on OPC-167832 were presented at the ASM Microbe 2018 conference in Atlanta, GA June 10, 2018. OPC-167832 is a newly synthesized carbostyril derivative which shows anti-mycobacterial activity by inhibiting decaprenylphosphoryl-β-D-ribose 2’-oxidase (DprE1), an essential enzyme for cell wall biosynthesis of Mycobacterium tuberculosis (MTB). The minimum inhibitory concentrations of OPC-167832 against MTB on both laboratory strains and clinically isolated strains including multidrug resistant/extensively drug resistant MTB ranged from 0.00024 to 0.002 μg/mL. OPC-167832 showed potent bactericidal activity against both growing and intracellular bacilli and therapeutic effect in an experimental mouse model of chronic TB at lower doses than other anti-TB drugs. OPC-167832 did not show antagonistic effects with the other anti-TB drugs in in vitro checkerboard agar dilution method and in a mouse model of chronic TB. Furthermore, OPC-167832 in regimens combined with delamanid showed superior efficacies to a standard regimen RHZE (rifampicin + isoniazid + pyrazinamide + ethambutol) in mice. We concluded that OPC-167832 is a new anti-TB drug candidate and could be a member of new generation anti-TB regimens which have potential to shorten the period of TB treatment. Here we report OPC-167832, a newly synthesized carbostyril derivative which is currently tested in clinical trials, shows strong activity against MTB in vitro. By genomic DNA analysis of its laboratory-isolated resistant strains, we identified the mutations of two genes (rv0678 and rv3790) are responsible for the resistance of OPC-167832. We have generated several M bovis BCG Tokyo strains overexpressing mutated rv3790 genes and found them to confer resistance to OPC-167832. We also confirmed that OPC-167832 inhibited the enzyme activity of recombinant wildtype DprE1 from a BCG strain. 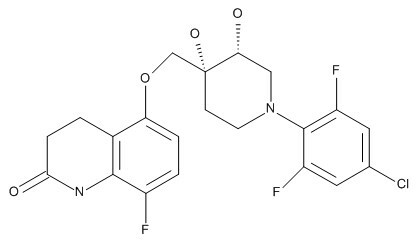 These results suggest that OPC-167832 kills MTB by the inhibition of DprE1, which abolishes the formation of a key precursor for the synthesis of arabinans on the cell wall of MTB. 2016. During the 47th Union World Conference on Lung Health in Liverpool, U.K. (October 2016), Otsuka reported it is developing OPC-167832 in combination with delamanid. OPC- 167832 is intended to target both drug-susceptible as well as drug-resistant forms of TB, and has a different mechanism of action than all currently approved anti-TB drugs. MIC for M. tuberculosis 0.00024 to 0.002 ug/ml. Mouse models of chronic TB studies showed that delamanid and OPC-167832, along with one or two other new anti-TB drugs, are more effective than standard regimens against both drug-susceptible as well as multidrugresistant TB. Early results suggest that regimens with OPC-167832 and delamanid at the core could potentially shorten treatment duration and improve treatment outcomes. The US FDA has already granted the investigation of OPC-167832 a Fast Track status, and human trials are underway.